Skip those expensive, store-bought hair masks and opt for something simple and homemade. An egg and mayonnaise mask can help restore moisture and shine to dull hair. Mixing the two ingredients is a natural, cheap, easy and effective method for deep conditioning dry or normal hair. If you have oily hair, use raw, whipped eggs as a homemade conditioner and omit the mayo. While any kind of raw egg can help heal hair, stick with farm fresh eggs for the best results. Eggs not only contain protein and fatty acid to help nourish and rejuvenate hair, they contain vitamins A, D and E, which are important to basic hair health. Look for eggs with thick shells and rich yolks, as these are marks of good quality. 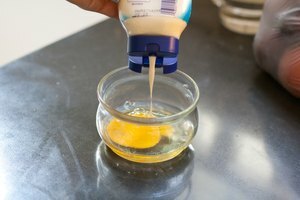 Mayonnaise is a mixture of eggs, oil and vinegar. The oil helps moisturize and protect your hair while adding deep shine. 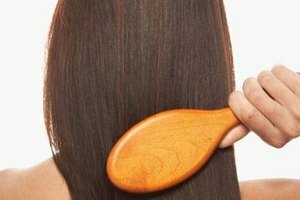 Vinegar gently removes mineral deposits and balances the hair's pH level. These three ingredients mixed together create a perfectly balanced conditioner. 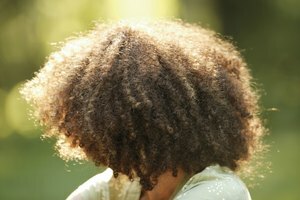 Remember to use real mayo for your hair -- mayonnaise-style substitutes contain too many chemicals and preservatives. The point of adding a fresh egg to an already egg-based mayonnaise is to give your hair the perfect balance of fresh nutrients. Once an egg has been emulsified and whipped into mayonnaise, it loses many of its vitamins and minerals. So adding the fresh egg to the hair treatment restores those lost nutrients. Create a homemade egg and mayonnaise mask for shoulder-length hair by whipping together one egg and 1/3 cup mayonnaise in a small bowl. Spread the mixture on damp or dry hair and massage gently into the scalp. Cover your hair with a shower cap and let the mixture set for 15 to 30 minutes. Use a gentle shampoo to remove the treatment, rinse well and let your hair dry. If you're allergic to eggs or any of the ingredients in mayonnaise, don't use this hair mask. It doesn't matter if the allergy only seems to be linked to ingestion of the item, you're still at risk of an allergic reaction from skin contact. If you suffer from severe acne, you may also want to skip the treatment because it's oil-heavy.